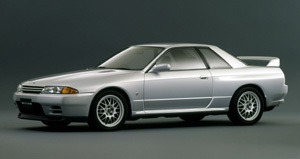 The R32 GT-R was introduced in 1989 and continued the very successful racing heritage of its famous GT-R predecessors with several championship titles. This car was built to fit Japanese Group A racing specifications and only hit the road, because the rules demanded its street homologation. So in reality, this is a race-car for the street that comes powered by a 2.6-liter inline-6 engine capable of 500+ hp and mated to one of the most intelligent all-wheel-drive systems ever developed. A length of 178.9 in. (4,545 mm) and a width of 69.1 in. (1,755 mm) make the R32 the smallest of all newer GT-R's, and with a height of 53.3 in. (1,355 mm) it is also 0.2 in. (5 mm) lower than its successors, the R33 GTR and R34 GTR. 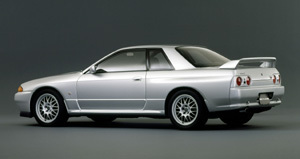 The R32 Nissan Skyline GT-R looks sporty, although, from today's point of view, the car's design appears quite dated. The front is dominated by the front spoiler, which is clefted with air inlets and makes for an aggressive appearance on the street. Except for some bulges around the wheels, the side view is very similar to standard coupe's, just with a slightly taller rear-wing. The 16-inch tires appear undersized for the large wheel-housings, a characteristic feature that (unfortunately) has been kept on the succeeding version as well. The GT-R's back gets the twin round tail-lights common to all R32 series Skylines, and can only be distinguished from the standard coupe by its larger wing and the GT-R badge. The overall design of the car feels actually quite simple and inconspicuous. There is no real hint for outsiders to show what this car is really capable of. It rather looks like a simple family-coupe that some over-ambitious tuning-enthusiast put its hands on. But in reality, the clefted front spoiler, the bulges, and the rear wing are no exaggerated design tricks, but features directly taken from racing. They all have their purpose in a car that, at the time it was built, was considered to be one of the best sports cars of the world - maybe even THE best.